Dan Straily was locked into a pitchers duel with Derek Holland through the first five innings tonight. Both pitchers had held their opponent scoreless. Straily survived the top of the sixth inning holding the Rangers scoreless, but was lifted in the bottom of the inning for a pinch hitter. Joey Votto drove in the first run of the game in the bottom of the sixth, allowing Dan Straily to win this pitchers duel. Tucker Barnhart added another RBI hit in the seventh inning, and Votto had a sac fly in the eighth. 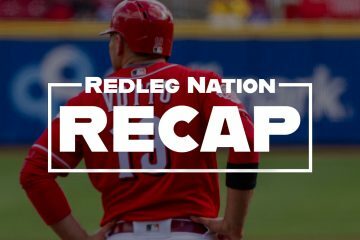 It was not always easy, but Raisel Iglesias and Tony Cingrani finished off the Rangers the rest of the way, and the Reds took the first game of this short two game series 3-0. According to FangraphsÃ‚Â WPA statisticÃ‚Â (winning percentage added), the most important play of the game was Joey Votto’s RBI single off Derek Holland with 2 outs in the 6th inning, giving the Reds a 1-0 lead.Ã‚Â That play increased the Reds chances of winning by 16.7% (from 55.3% to 72.8%). Straily was very good again for the Reds tonight. He has now allowed 3 ER or less in 10 consecutive starts, and they are all considered quality starts with the exception of one start where he pitched 5.1 innings. In his last four starts, he now has 22 strikeouts to just 2 walks. Straily has a 3.57 ERA/4.43 FIP through 151.1 IP this season. It’s hard to believe the Reds picked this guy up off the scrap heap right before the season started. Joey VotoÃ‚Â had two more hits tonight, and an RBI sac fly. Votto has reached base in 33 of the last 35 games (one of those games he only had one pinch-hit PA). I’ll say it…..Joey Votto is at this point in his career the greatest Reds offensive player ever. Period. Billy HamiltonÃ‚Â is just….well Billy Hamilton. He made an incredible diving catch in the 6th inning. I’ll just let the GIF below do the talking. Raisel IglesiasÃ‚Â got himself into a jam in the 7th inning with runners on 2nd and 3rd with only 1 out. Iglesias then proceeded to strike out Jurickson Profar and Ian Desmond to end the threat. 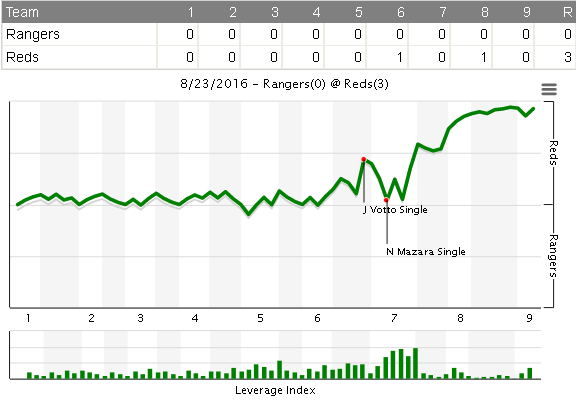 Iglesias then pitched a perfect 8th inning, retiring the heart of the Rangers order. Jose PerazaÃ‚Â had two more hits today, and he is now a ridiculous 11 for 19 since being recalled. The Reds have to find a way to play Peraza everyday in the big leagues. He is at the very least….very exciting. Tucker BarnhartÃ‚Â had an RBI double in the 7th inning. Joey VottoÃ‚Â did make a pretty poor decision trying to score from first base in the 4th inning. He was out by a mile. Tony CingraniÃ‚Â did get the save, but he walked two batters. That’s just not a recipe for success. –All three Reds runs scored tonight were the result of a walk. Walks are important, folks. –Always good to get a Reds game in well under three hours. Especially during a rebuild. Did Votto run through the stop sign? Couldn’t turn on the game until the 5th inning. Billy was sending him all the way, because the outfielder misplayed the ball. Votto assumed he was just going to stop on 3rd and didn’t pick Billy up until late. IMO…at that time Billy should have stopped him. Votto was slowing down, Hatcher waived him around. I don’t think Votto would have scored even if he hadn’t slowed down, at the least it would have been a play at the plate. Hatcher shouldn’t have risked it, so I put the blame on him. Votto looked pretty ticked after he got up from his slide. Being slow is a messing up fundamentals? He shouldn’t have been sent because he had 0% chance of being safe, unless the throw got away from the catcher. The replay I saw showed me fundamentals that were not executed- Running hard regardless of speed and turning third like you know which way home plate is. There have been plenty of bonehead plays the past month that I was also referring to. I love the fact that he is a cerebral hitter and hope he influences other teammates on hitting approach, but he seems to hurt the team with improper base running not just by being slow, let alone poor decisions fielding. Looking at the replay, it seems like Votto assumed he was going to stop at 3rd and didn’t run hard into the base. It also seems like he didn’t watch Billy as he was running, making two mental mistakes on the same play. The 3rd base coach is generally down the line, watching the play in the outfield, waiting until the last moment if necessary before determining whether to send the runner or not. The assumption is that the base runner goes as hard/fast as he can until stopped by the coach. In my opinion, this was a total screw up by Votto. I agree Votto was pulling up before he reached 3B even as Hatcher was waving him on. I think JV knew the ball had not been caught but was clueless that it had been misplayed after it dropped in. Does anybody have a take on exactly what happened out in RF on the play? It seemed to me almost like the RF lost the ball after it hit in front of him and bounced by, like he didn’t realize it had bounced by or wasn’t sure on which side of him it had bounced. I thought it was really whacky looking. Patrick, this is more a reply for down below when you said that Hatcher shouldn’t have sent him and he was out because he was slow. Votto was late picking up Hatcher and had slowed considerably from his already not so brisk pace as he approached 3B. He picked up Hatcher just before hitting 3B and tried, unsuccessfully to turn it back on. If he had run hard the whole way, I think he had about a 50/50 shot of making it. As soon as he slowed Hatcher should have thrown up the stop sign, so that’s on Hatcher. The fact that he started slowing down before that though is on Votto. I didn’t see the whole game between my daughter’s soccer practice and driving around but we were having dinner and the game was on when that play occurred. I got a good look at what happened and there were a couple good replays. See if you can dig up the replay and watch for yourself. I think you’ll probably agree. A very solid outing by Straily. Again. BHam’s catch might be his best this season. Incredible catch. Again. Votto being Votto. Again. A win over another contending team. Again. Back to winning ways. A small sweep tomorrow gets this upcoming road trip west off on good footing. 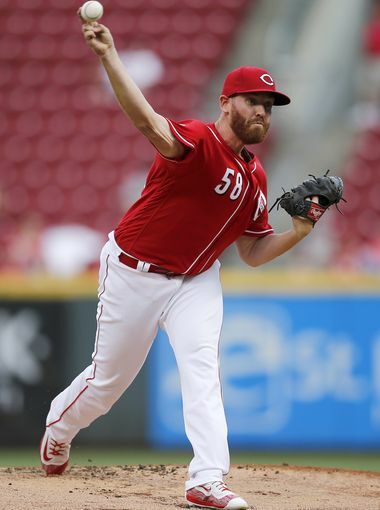 18 runs given up yesterday & 0 tonight, scrap heap or not, Dan Straily has to be part of the RedsÃ¢â‚¬â„¢ plans moving forward. GO REDS! Yes, the night before, Finnegan had a no-hitter going through six. I know the peripherals aren’t great for Straily but he is sure passing the eye test. While I doubt he can continue to outperform his peripherals to the extent that he has, it may be possible that he can outperform them some. In which case, I’d have to think he could pitch on the back end of the Reds rotation the next couple years. For those that didn’t see the catch, look up the full replay somewhere…anywhere. Look how far he had to go (123ft) and how fast he was going. I love GIFs in the recap, keep them coming! As incredible as the GIF is, it still doesn’t do it justice. Yeah, the GIF definitely doesn’t it it justice. You can’t see how incredibly far he ran to catch it. The left fielder probably had as much reason to make a play on the ball as he did. Agree! It was an amazing play! The GIF doesn’t give you the full perspective on it. What a team win! Tom B. just said on TV that the Reds have won Straily’s last 8 starts!! Wow!! I don’t know how he does it exactly but they just never seem to square him up and Billy basically saves him 1 run a start with some crazy catch! Once a pitcher gets that rep that he doesn’t walk anyone then they seem to actually swing at stuff just off the plate. Straily fools them for 4 or 5 innings then Billy & Co. catch a few bullets and he has another 6 inning/quality start!! Disco/Straily/Bailey 3-4-5 for next year. I really believe Iggy or Lorenzen could be a 2 if they got back in the rotation but we still need to groom another top of the rotation guy! Or Disco could develop into a #2 if he could work on a split or something to neutralize lefties! Then we’d have 2 two’s and just need to develop a decent 3 or 4 out of Garrett, Reed, Finnegan, Lamb, etc. I still say the nice thing about Straily is….his margin for error is so low that we’ll know if his clock has struck midnight pretty quickly. Ride him for as long as he’s doing what he’s doing!! I think you gotta leave Iggy & Lorenzen in the pen – but they should be available to pitch 2 innings (or more if needed). I just don’t think their arms can shoulder the workload of what’s required of a starter. I’m with you on that, in particular the 2 inning part. Both are relievers the Reds tried to convert into starters. Iggy broke down 3 times as a starter and I read that the Reds were the only team that saw him as a starter, given his build and delivery. The important part for me is that they both continue to throw 2 (and more) innings a time, as used to be standard for relievers. Price surprised me the other day by saying her wanted to stay away from “7th inning, 8th inning roles” but I’m not sure if he was only talking about this season or looking into the future. If only they had this type of scrap heap luck when it came to relievers. Or perhaps Straily was considered a middle reliever before he earned his way to the rotation, I really don’t remember or know if I followed spring training to be aware of that answer. Bottom line a good signing that shows the FO isn’t entirely innept, but if they would just cut the deadweight quicker things would be good.. they tend to hand on to everything and assess after the season.. when its clear you have deadweight why let it drag the entire team down.. sometimes a quick drastic decision early is required, and I don’t ever see it with this group. The Cardinals, by comparison, don’t tolerate failure for very long. There are things you control, like Chapman, the international signing budget and building bullpen arms. Straily was not in the starting rotation at the start of the season. The Reds went with Tim Melville instead and had Straily in long relief. Straily was ticked off about it and I don’t blame him. The Reds have had a bit of scrap heap luck with picking up Blake Wood as a reliever. Wood was victim of a roster crunch in Pittsburgh. Had been excellent in AAA. He’s 31. The Reds had to offer him a major league contract to sign him. Some times you just have to have a body, even if they are not doing well. Sometimes you have no one to bring up without harming that persons future. 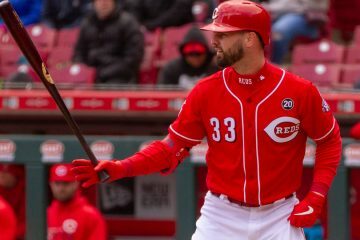 Although I very much enjoy reading the RNL game recaps I am becoming suspicious that the writers are using Photoshop or some other tool to doctor the Billy Hamilton catches. There is no way Billy is making those catches night after night. Actually yes, he is making those catches. You should find the full replay that shows just how far he went to get to that ball. Most CF would have immediately run towards the wall, ready to play the carom. What a play! Straily is a pitcher. He has figured it out. He does not throw 98 like Jumbo…He never will. Jumbo is not a pitcher. He is a thrower….I think Cingrani will figure it out. I think he will become a good “loogy”. Give Straily a contract. Give Billy an extension. Cingrani is becoming a real puzzler. After a so-so April and awful May where he struck out 24 in 22 innings. he only has 14 K in 31 innings or so since. I would think his peripherals look awful with 14 BB, but he has saved his last 11 straight chances by my count. Ignoring the one meltdown against the Cards as anomaly has anyone seen such success with a drop off in strike out rate. His peripherals are awful. xFIP 5.47, SIERA 5.17. He’s evidence for the proposition that lots of pitchers can close out games. In fact, Cingrani might be the worst pitcher in the Reds bullpen right now. Ohlendorf included. I meant to make a point that in future seasons when fans start clamoring for 1 pitcher to be the closer, we can always point to 2016 and say Cingrani saved 20 games throwing a mediocre fastball 95% of the time. I still have hope he can be a fourth or fifth option when you consider his minor league stats and 2014 success and this is the 1st season he has not been injured. The strikeout rate is bizarrre to me considering what he was doing before & outside of the one Cardinal game he rarely gets lit up- especially since May when the strike out rate dropped. What to think of Cingrani. You want to convince yourself he’s going to become that next tough lefty out of the pen, but that’s what this year and 2017 is about. He has an opportunity and the window is still open, but won’t be forever. Andrew Miller was a top 10 pick and a central part of the Miguel Cabrera trade in 2007, but was awful as a starter and took longer than several teams were willing to wait before he became the best lefty out of the pen in the game not named Chapman. I would give Cingrani a little more time. I said the same about Hoover 2 years ago though. Cody Reed was back on the mound for the first time tonight in AAA. He started and went 6 innings. Sounds like a mixed bag result. He allowed just 2 runs, both earned but allowed 10 hits plus 2 BB while striking out 0. 93P/60S He left with the Bats trailing 2-1. The Louisville bullpen gave up the ghost behind him in what became an 8-1 loss. Dilson Herrera DHed and drew 2 walks and K’ed in 4 PAs. Bats only had 3 hits. It looks to me like Jose Peraza has arrived to stay. Maybe he at least learned some things when he was sitting on the MLB bench and was able to put them into practice playing everyday at AAA because he hit better during his time down than before he came up the first time and certainly looks like a different hitter than he did during his part time player stint earlier at MLB. He seems to have a ranginess about him that could eventually generate good gap power as he matures, especially if they would get him on a strength program. I don’t see Peraza as ever having even gap power. That said, I’m wrong an awful lot and that HR the other day was out just about anywhere. I’d like to read an RLN article about what to do with Straily going forward. I like him but it’s not an easy question, the Reds would have to pay for him to stay. His season is not totally out of the blue. His stats for the A’s in 2013 were very similar to this year. Straily is under Reds control through 2020. Starts arbitration in 2018. It looks like people who complain about Joey’s lack of RBIs are going to have to find something else to complain about. Possibly, but it’s not as clear as all that. Look at what Frank Robinson did in 1962. More importantly, look at what Robinson did in his 10 seasons with the Reds. And Robinson was a GREAT base runner, opposing players literally feared him on the bases. But I can see both sides of this debate. In Robinson’s day a hitter would get to see the same pitcher 4 or 5 times in a game. Joey has to hit against LHed specialists and/or high heat when the starter leaves in the 6th or 7th. Robby himself has pointed this out as making hitting more difficult today than in his day. Ultimately it’s apples and oranges, take your pick. Regarding Votto being the best ever; he is, in my opinion . It was one of the first articles I wrote here. He and Robinson are pretty much in a dead heat based on Robinson’s years in Cincy. Based on what? A statement that definitive needs something(s) to back it up. I admire Votto and have the utmost respect for his accomplishments, but his he really better than Joe Morgan in 1976? Not bad, though, to be in the same breath with Joe Morgan and Frank Robinson in their primes. I’m with you. No one loves Votto more than me, but Morgan is almost impossible to top. And that’s without factoring in position scarcity. Votto has the highest OBP, OPS, and wRC+ in Reds history. He is also second in SLG. So it’s pretty simple to conclude that Votto has been the best offensive player in Reds history to this point in his career. Votto hasn’t had a season as good as Morgan in 1976 (184 wRC+) or 1975 (178 wRC+), but Votto’s 2015 (174 wRC+) and 2010 (173 wRC+) were pretty close. Don’t forget that Morgan hit .236/.347/.385 in 1978, and hit .250/.379/.376 in 1979. Votto will decline at some point, and then we will have reevaluate, but at this point, he has been the best. As to position scarcity, that’s why I said offensive player. I should have said hitter, but I figured some clown would say all he does is walk, and bring up Rose is the hit king. I’d probably put Bench ahead of Votto because of defense, but I still think it’s close. If you’re saying “offensive player ” then you have to include base running, which helps Morgan in a head to head with Votto. Morgan had back to back seasons where he was over 60 runs above average on offense. Votto has never crossed that threshold. I think you could make a case that Votto is the best hitter. Its pretty subjective and depends on what you value. But no Red has ever been better than Morgan wad in 75 and 76. Almost 21 WAR in 2 years on 2 championship teams. I probably should have said hitter. That was what I was thinking, but tried to say it another way to keep the Rose crowd from burning me at the stake. Hitter is a different case. I wouldn’t argue about hitter. Decently rigorous for a fan blog, I think. Does anyone know if there is Statcast fielding data published anywhere? I am trying to find it but not having any luck. I really want to see how many players have covered 123ft in one play. That catch was incredible. I haven’t found it if it is. Would love to see throwing speed. That said, I’m sure people have covered that distance to make a play. In fact it happens fairly often. The thing is that it usually happens on lazy fly balls. Billy covered it on a hard, high liner. He covered it in a lot less time than a lazy flyball. Straily is paying dividends, he certainly should be in the 2017 plans. Didn’t Walt pick him up off the scrap heap? How about Peraza? Wasn’t he the guy we held out for in the Frazier deal? Could he turnout to be a pretty good player? My point is Walt has had his share of swings and misses but he is far from the incompetent dolt many on here portray him as. A key to our off season will be finding a home for Cozart and BP ( with his approval) and sorting out our bull pen. For the record, I think WJ is an incompetent dolt on drafting and development, especially with Latin hitters, but will concede that his trading has been generally fine. Bronson Arroyo didn’t become a full time big league starter until his age 27 season, same as Dan Straily. The stats have some similarities (low K rate, nearly a hit per inning allowed). Do you think we’ve stumbled onto the next Arroyo? Meaning, a guy who gets by on location, pitching backwards, and good defense? The thing about Dan Straily is how fate has played a role in him being in Cincinnati. I don’t really look at him being picked up off the scrap heap. It was really a numbers game in San Diego when he got released at the end of March in spring training. The A’s traded Straily to SD about a week prior to SD releasing him. Remember, SD had James Shields, Cashner, Ross, Rea, and Friedrich to start the season as their rotation. Therefore, if the A’s had not traded Straily to SD, the Reds would have most likely never had the chance to pick him up. If the A’s had released Straily instead of trading him to SD, all the American League teams would have had a chance to make a waiver claim before the Reds. As it turned out, SD releases Straily, the Phillies passed and the Reds snatched him up. I believe the point you made about Straily being a waiver pick up is important to note. He wasn’t on the scrap heap where anybody could have gotten him because he was unwanted. He was taken by the second team that had a shot at him. Also I don’t believe the Padres had any intent of actually releasing him if he had gone unclaimed. Their intent/ hope was that he would clear waivers so they could outright him off their 40 man MLB roster into the minors still under their control. It is one of the tried and true roster management tricks to wait to the last minute to DFA a guy out of options that a team really wants to hold onto but has no 25 man spot for because the feeling is that other teams will be making or will have just made their own final roster moves and thus be less likely to make a waiver claim. Recall that in 2012 the Reds picked up Alfredo Simon on waivers just before opening day in a similar move to acquiring Straily. On the flip side, to make room for Simon, no less than Todd Frazier was a late option back to AAA after he’d been told he had made the MLB team. As mentioned Straily’s margin for error is small but he can pitch just like Arroyo.Bronson had a stinker every now and then but always seemed to bounce back.Straily hasn’t had a stinker yet and may not have one but he has to be in the plan going forward regardless.He gives you 6 innings and keeps you in the game and also keeps the ball in the park.He is a keeper.Peraza has been given an opportunity by default and is taking full advantage of it. Finnegan, in some ways, is more in line like Bronson Arroyo. Not with stuff or location. With Bronson Arroyo, we didn’t know if Good Bronson or Bad Bronson was going to show up for the game. Usually it was Good Bronson. Finnegan is much the same. We don’t know if Good Brandon or Bad Brandon will show up to be the starting pitcher for his games. A majority of the time it has been Good Brandon. Steve hit the nail on the head when saying lots of pitchers can close out games.Cingrani throws one pitch at 94 -95 and everybody knows that’s all he is going to throw.Yet he manages to get it done.I don’t know anything but I would think he would throw something else just for fun but it almost never happens.He may end up with 20+ saves with that one pitch.He makes it really interesting. If by “interesting” you mean “frightening,” it would be hard to disagree. Straily in some ways reminds me of Bronson. The thing that jumps out at me about Straily is the swing and misses he gets from the hitters. For a guy who isn’t lighting up the radar guns. some of the swings are down right ugly. He throws strikes and the team has won many of his starts. I believe 8 in a row. More then any other pitcher on the staff he has the opposition off balance at the plate. I keep waiting for the league to catch up to him but it hasn’t happened yet. I have two words for those involved in this Straily infatuation……………. Alfredo Simon. I am just pointing out that he had a glorious half season for the cost and the Reds got some return for him but Straily having a productive year doesn’t mean he is a good pitcher. I will remain hopeful that he continuous his success but as these younger arms who are probably better pitchers acclimate to the major league level we will see. I don’t know if Stephenson will be ready in 17 or not but if he is that would probably put Straily as the long guy in the pen. No huge arbitration contracts in 2017 and no tough decisions to make yet though right? You love to have the problem of cheap major league minimum guy comes out of nowhere to win 13 games for you. The youngsters got a bad case of growing pains right now. Any contract experts out there as it applies to arbitration and when the Reds start accepting risk on Straily? Can’t be earlier than 2018 I would think. Straily will finish the 2016 season with 2.126 years of service time. That will probably be very close to super-2 status, but will probably fall just short of super-2 status. Straily currently makes league minimum salary, just over $500K, and is playing in his age 27 season. As things stand now, the Reds would have team control through Straily’s age 31 season. If Straily obtains super-2 status for 2017, then the Reds have team control for 4 years of arbitration. If Straily does not obtain super-2 status for 2017, the Reds have team control for one more season near league minimum and then 3 seasons of team control through arbitration. Either way, Straily will not be expensive in 2017 and the only way he becomes expensive in arbitration would be if he continues to have dramatically improved success as a starter. The Old Cossack is voting that Straily does become expensive through arbitration! Thank you. Sounds like a solid starter for 2017 while we await more clarity on our stable of young pitchers.